Crockpots are nonexistent in Thailand because why would you need one when you can get a quick, authentic Thai meal for a dollar when you walk out your door down the street a few blocks? But in America, it’s impossible for me to walk out my door and get cheap, legit Thai food—especially if just 10 days ago I had just given birth to a sweet baby girl and could barely walk around my apartment. After Milana arrived, my mom cooked for us while she was here, and then my church friends brought us food every other night for about a month. When our friends asked us what food we preferred, we of course said Asian, but were grateful for anything. We were in awe each night as amazing meals arrived at our doorstep, and we didn’t have to worry about making dinner while adjusting to life with a 2-year-old and newborn. But on one of those in between nights when we were out of leftovers and didn’t have dinner coming that night, I decided I couldn’t go another night without homemade Thai food. I didn’t have energy to cook anything that took more than 10 minutes of prep, so I scrounged our pantry and found some Thai curry paste that Dom’s mom had given us from Thailand. Then I took a can of Chaokah Coconut Milk , chopped up some chicken and stuck it all in the crock pot and waited to see what would happen. 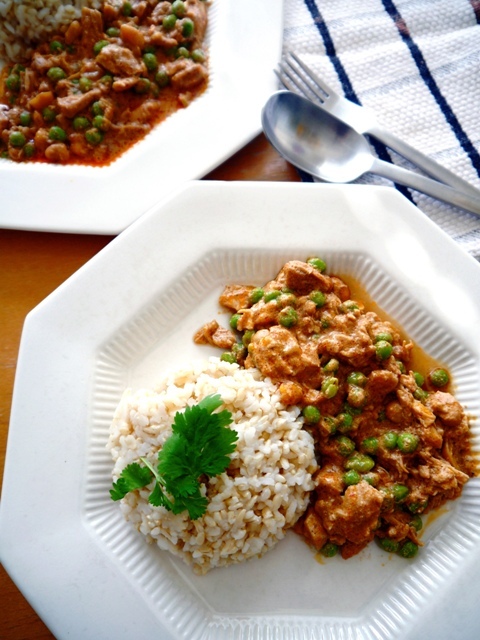 Later that day I tasted my crockpot Thai chicken curry, added some fish sauce and sugar to balance the flavors, threw in some frozen peas that were hiding in the freezer, and after they had warmed, I put ladled up the curry for dinner. Our Thai tongues were in heaven! It wasn’t authentic, it didn’t have all the proper veggies and herbs we would normally put in Thai curry, but it didn’t matter. The chicken was so tender and full of Thai flavors and that’s all our Thai-food-starved-selves needed. 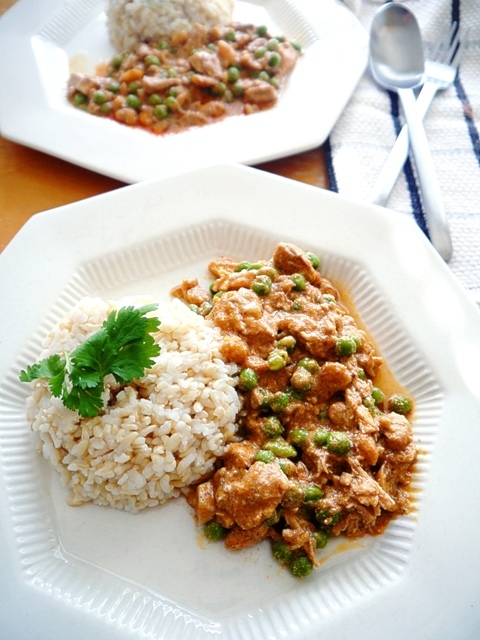 So if you know you are going to have a crazy night this week and need something to throw in the crockpot, know that this crockpot Thai chicken curry recipe is simple and easy, and makes a tongue desperate for Thai food happy. Enjoy! 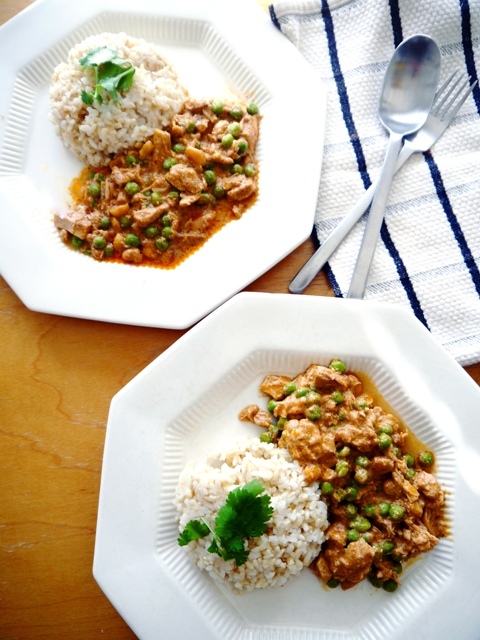 Only 10 minutes of prep in the morning, and your crockpot Thai chicken curry will be ready for dinner! Add the cooking oil, curry paste and coconut milk to the crock pot. Stir to break up the curry paste some. It will break up more as the curry cooks. Let it cook on high for 4 hours or low for 8 hours. Once it's done, add the frozen or fresh veggies. The frozen veggies should be warmed within a few minutes. The fresh will take a bit longer. Then add fish sauce and sugar to taste. If you are using Massaman curry paste, feel free to add in some peanuts when you throw in the veggies. You can use boneless, skinless chicken breasts, but it wont be as tender as if you used thighs. Oh your blog makes me SOOO HUNGRY!!!! Hope you’re adjusting into life with 2 kids Sherri!! 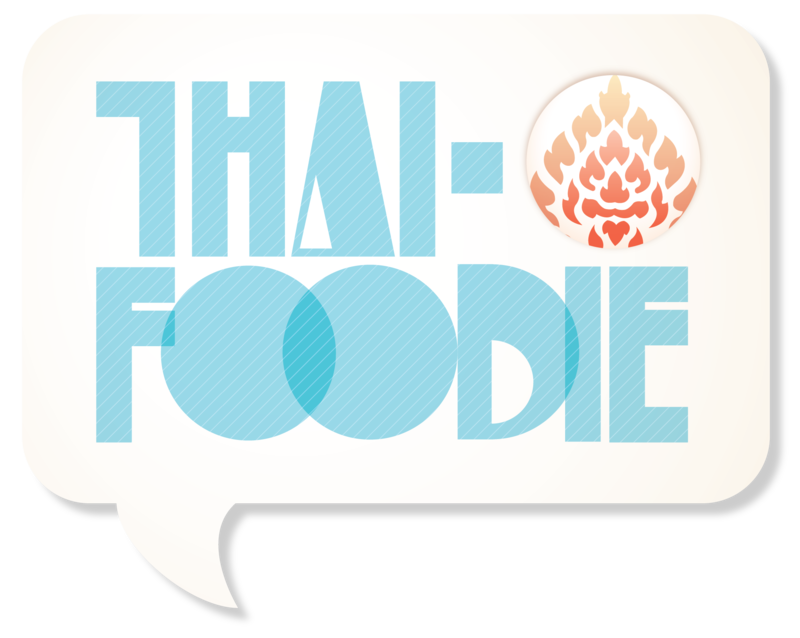 I wish we could do a huge thai cook up together!!! Thanks for posting this recipe! I love many different kinds of curry, but Thai curries are definitely my favorite. I really like maesri curry. It seems like it should be easy enough to find it at any Asian market. I can’t wait to try out this curry with chicken and rice! Thanks for your sweet comment Deanna! I like Maesri curry paste too, and I’m sure you can find that at your local Asian market. Let me know how you like it!